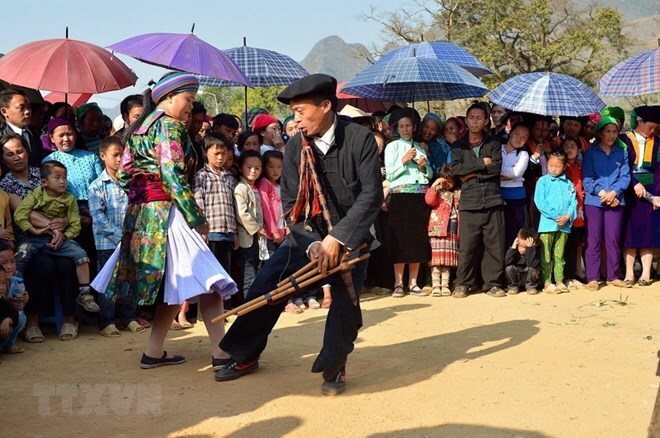 Ha Giang (VNA) – Festivals featuring peach flowers and the culture of the H’mong ethnic group will be held in Meo Vac district, the northern mountainous province of Ha Giang from February 21 – 22 (the sixth and seventh days of the first lunar month). According to Mua Thi Hong Sinh, Vice Chairwoman of the district People’s Committee, numerous activities will take place during the festive time, including the Gau Tao spring festival, contests of nem con (throwing a ball through a ring high above the ground), group panpipe dances, and peach flowers festival. Visitors will have a chance to experience daily-life activities of H’mong people, such as weaving, grinding corns, making buckwheat cakes, making Khen (panpipe), among others, Sinh said, adding that they can also buy hand-made souvenirs and enjoy local food. The events aim to promote the traditional cultural values of ethnic communities and landscapes in the Dong Van stone plateau, thus luring domestic and international tourists. Dong Van plateau was recognised as a member of the Global Network of National Geoparks in 2010, becoming Vietnam’s first geological park and the second in Southeast Asia. Covering a total area of 2,356 km2, it is 80 percent limestone and contains the fossils of thousands of species of prehistoric creatures from 400-600 million years ago. It is also home to over 250,000 people from 17 different ethnic groups, who boast unique cultures that have been fostered over the centuries. Recently, 14 archaeological sites were excavated in Dong Van, Meo Vac, and Yen Minh districts, in Dong Van plateau, revealing hundreds of relics believed to appear in the prehistoric and prehistoric times.